As we have discussed over the past few weeks, Fiji is a popular filming spot for Hollywood’s elites on the big screen. But also Fiji is a great choice for filming television series, especially as of recently. We’ve seen several TV series shot here like the sizzling reality dating show “The Bachelorette” and the adventure reality TV series “Survivor.” In fact, the crew and stars of “Survivor” are back in Fiji filming again in 2016!! As you read this article, they are currently filming the 33rd season of “Survivor” on Mana Island in the Mamanuca Island Group. The show will pit the millennial generation against members of generation X. Season 34 of “Survivor” will also be filmed there as well! Here’s a rundown of some other TV shows that chose beautiful Fiji for filming. The remake of “The Swiss Family Robinson” as a television series was shot on Nanuya Lailai Island in the Yasawa Island Group. This TV series is full of stunning scenery that will actually make you want to get lost in paradise too! The series starred Richard Thomas (“John boy” in the Waltons) in a tale of a family searching for adventure. They certainly find adventure (and a whole lot more) when they get stuck on a deserted island with no shelter. The movie is for the whole family and it is full of love, heartbreak, happiness, pirates, wild animals, struggles with nature, and more. Ashley Hebert’s Season 7 of “The Bachelorette” did not disappoint viewers with steamy romance, ridiculous drama, but best of all, the backdrop of gorgeous Fiji during the last episodes. Ashley now lives happily ever after with J.P. Rosenbaum and it was certainly a proposal in Fiji never to forget. Ashley whisked away her handsome potential suitors to some of Fiji’s luxury resorts with dream dates. A date in Koro Sun Resort in Savusavu included a seaplane charter to Namena Island to enjoy the beach and a park for the day, followed by a romantic dinner arranged by Koro Sun Resort amongst the 90-acre rainforest at dusk. They dined on beef fillet and walu fish. While at Namale Resort, they woke up in luxurious private villas tucked among swaying palms and sounds of the ocean. They enjoyed elegant dining, a spa experience, and romantic excursions. The finale was filmed at Vomo Island Resort. Ashley’s last two dates were held there, along with a special date to meet the parents. During the final rose ceremony, J.P. ultimately proposed to Ashley overlooking the gorgeous ocean and backdrop of the resort! Aw, we love happy endings like this in Fiji! Season 14 of “Survivor” was captured in Fiji (in addition to the newest seasons 33 and 34!). The filming for season 14 took place at Vunivutu (about 15 miles northwest of the town of Labasa) in Vanua Levu, Fiji’s second largest island. Challenges were held near this area on Katawaqa Island, Tivi Island, Vatudamu Point, and the fields along Wainikoro River. The exotic region of northern Fiji made for a perfect backdrop for the TV show’s many challenges as winner Earl Cole took home the title. “Survivor Fiji” was the first season of the show to have an odd number of castaways, with 19 people to start out the season. One of the ladies had to drop out the night before the show began taping because she was deemed not fit to participate. All contestants participated in at least one challenge before being broken up into two tribes, therefore moving to two different camps. One camp named Moto was furnished with some luxuries. They lived on a peninsula in Vunivutu Bay and stayed in shelters built from wood, a kitchen with dishes, a shower, and a toilet. The other camp, Ravu, was only given a pot and a machete. They lived on Druadrua Island off the northern coast of Vanua Levu. The exile island on the show was actually named Sausau Island, just five miles from Vunivutu. Challenges on the island included many crazy things like unlocking yourself from a cage underwater and eating interesting dishes. A memorable scene was seeing the individuals perform the Meke, a traditional dance of Fiji, in front of Fijian judges. The winners were able to indulge in a Fijian feast of chicken, pork, and seafood while enjoying more Fijian entertainment. Winners of other challenges got to experience a Fijian rain forest river rafting adventure on the Navua River, some enjoyed a picnic lunch with cute Fijian school children, and others took a seaplane to a luxury resort for a hot shower and dinner. 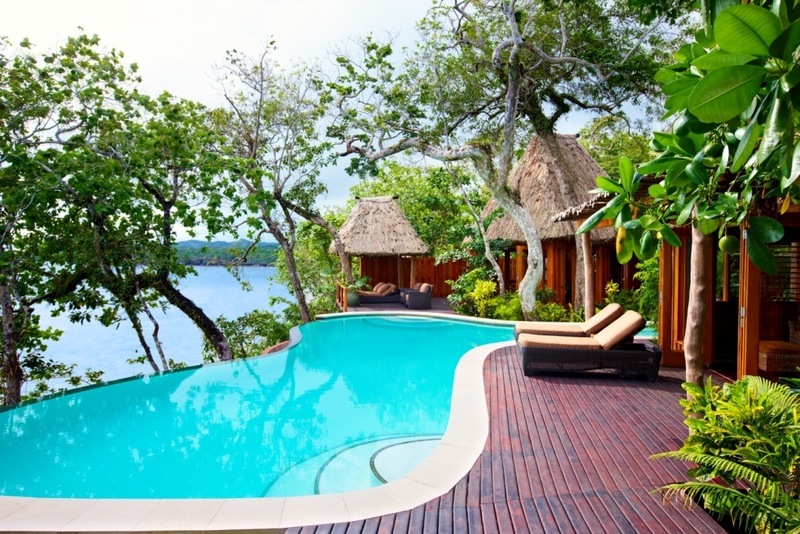 Resort visits included Namale Resort and Jean-Michel Cousteau. Best of all, the main takeaway of the country from winner Earl Cole was that Fiji is a beautiful place with unique culture and very friendly people. We hope you are as excited as we are to watch seasons 33 and 34 of “Survivor” filmed on Mana Island! !